3 - What is it ? 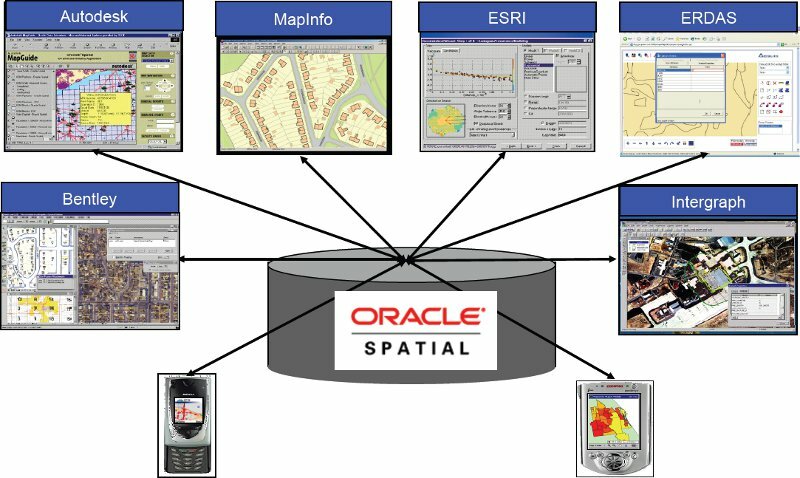 Oracle Spatial is an integrated set of functions and procedures that enables spatial data to be stored, accessed, and analyzed quickly and efficiently in an Oracle database. With vector data, points are represented by their explicit x,y,z coordinates, lines are strings of points, and areas are represented as polygons whose borders are lines. This kind of vector format can be used to record precisely the location and shape of spatial objects. With raster data, you can represent spatial objects by assigning values to the cells that cover the objects, and you can represent the cells as arrays. This kind of raster format has less precision than vector format, but it is ideal for many types of spatial analysis. In the raster geographic information systems (GIS) world, this kind of raster data is normally called gridded data. 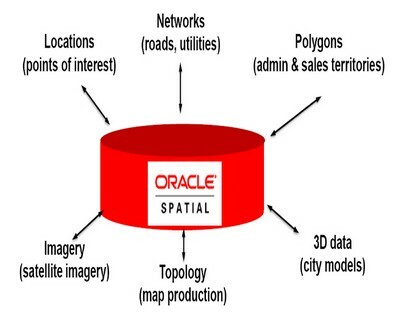 Oracle Locator is a cut down version of Oracle Spatial Standard Edition (SE/SE1) database installations. and procedures that use these types. A geometry is stored as an object, in a single row, in a column of type SDO_GEOMETRY. 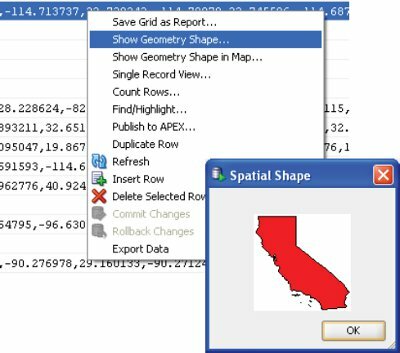 Spatial index creation and maintenance is done using basic DDL (CREATE, ALTER, DROP) and DML (INSERT, UPDATE, DELETE) statements. Spatial (like locator) is not designed to be an end-user application, but is a set of spatial capabilities for application developers. Get_Dims NUMBER Returns the number of dimensions of a geometry object, as specified in its SDO_GTYPE value. In Oracle Spatial, the Get_Dims and ST_CoordDim methods return the same result. Get_GType NUMBER Returns the geometry type of a geometry object, as specified in its SDO_GTYPE value. Get_LRS_Dim NUMBER Returns the measure dimension of an LRS geometry object, as specified in its SDO_GTYPE value. A return value of 0 indicates that the geometry is a standard (non-LRS) geometry, or is an LRS geometry in the format before release 9.0.1 and with measure as the default (last) dimension; 3 indicates that the third dimension contains the measure information; 4 indicates that the fourth dimension contains the measure information. ST_CoordDim NUMBER Returns the coordinate dimension (as defined by the ISO/IEC SQL Multimedia standard) of a geometry object. In Oracle Spatial, the Get_Dims and ST_CoordDim methods return the same result. ST_IsValid NUMBER Returns 0 if a geometry object is invalid or 1 if it is valid. (The ISO/IEC SQL Multimedia standard uses the term well formed for valid in this context.) This method uses 0.001 as the tolerance value. (Tolerance is explained in Section 1.5.5.) To specify a different tolerance value or to learn more about why a geometry is invalid, use the SDO_GEOM.VALIDATE_GEOMETRY_WITH_CONTEXT function, which is documented in Chapter 15. The default unit of measure is the one associated with the georeferenced coordinate system. The unit of measure for most coordinate systems is the meter, and in these cases the default unit for distances is meter and the default unit for areas is square meter. By using the unit parameter, however, you can have Spatial automatically convert and return results that are more meaningful to application users, for example, displaying the distance to a restaurant in miles. Spatial uses the information in the SDO_UNITS_OF_MEASURE table. -- Any invalid objects ? -- given geography (such as city or state). -- cola has growth potential, and so on). -- Cola A. This area happens to be a rectangle. -- has strong growth potential, and so on. -- first three areas of interest. -- layer (that is, table-column combination; here: COLA_MARKETS and SHAPE). -- Preceding statement created an R-tree index. -- Do two geometries have any spatial relationship? An example of a "polygon with a hole" might be a land mass (such as a country or an island) with a lake inside it. Of course, an actual land mass might have many such interior polygons: each one would require a triplet element in SDO_ELEM_INFO, plus the necessary ordinate specification. Exterior and interior rings cannot be nested. For example, if a country has a lake and there is an island in the lake (and perhaps a lake on the island), a separate polygon must be defined for the island; the island cannot be defined as an interior polygon ring within the interior polygon ring of the lake.